In the spirit of full disclosure, I have to let you all know something. My world's been rocked. Changed forevermore. I mentioned The Funk of '09. Christmas break we were hit by a storm. Not the tiny, baby versions of storms we've now become accustomed to here in the Kinda Country. It was a REAL storm. With LOTS of snow. Like make sure you had milk, eggs and bread weather. And BigDaddy was MIA at a coaches' convention. of course, right? So what's a mom to do? You can only play in the snow for so long, especially since were were on the merry-go-round of winter colds. we played, drank cocoa, visited with neighbors, watched movies and DVR'd TV and played wii. So there I was. exhausted from shoveling the driveway yet again. a bit bored. a bit stir crazy. and the only adult around. I picked up Twilight from the bookcase for some totally mindless entertainment. A Young Adult book series? really? But it was portable enough to drag with me all over the house. brain candy to fill time. easy reading. something fun. Plus we already had the entire series courtesy of Memaw. (BigDaddy wanted to see what the big deal was when he saw half his team reading a series of books at a feverish pace, in season, during college.) It took me a bit to get into it, but about 1/2 way through.... I was a goner. Done. I became a Twi-Mom and never looked back. I read the remaining 3 1/2 books in about 4 days. One 629 page novel in 24 hours. kid you not. I wanted more. more vampires. and more werewolves. And thankfully the freezer was stock full of nuggets and fruit for smoothies. In typical lunzy fashion, I researched every.single.thing. I could find on the author Stephenie Meyer, the back story, the on-line forums-- anything my best friend Google could whip up. I found SM's website, the official Forks, WA website, the main Twilight big dog forum--Twilight Lexicon, and the La Push/Quileute Reservation homepage and Saturday Night Live clips on hulu. I also realized I wasn't alone. This series had a profound effect on a lot of women. Women and other moms my age or older. Twi-moms. It amazed me. And then I found a post about someone looking at this effect from a clinical view. dopamine, norepinephrine, and serotonin--chemicals in our bodies reacting to the book. The theory was that the books evoke so many real feelings, much like first love/falling in love. it feels good. you want more. and more. You get addicted to the "high." Suddenly you're 17 and falling in love for the first time. Even if you are in your 30s. Did the book change my life? No. yes. well, kinda. I snapped out of The Funk. it shook my life up and things got moving. Crazy, spontaneous things that were just absurd. but I rolled with it. embraced the crazy. and guess what? Twenty-Ten is off to an amazing start! Shortly after I finished the books, BigDaddy and I went to lunch and I joked that since I'm now this crazy "Twi-Mom" we should head out to Port Angeles, WA (a movie theater location from the books) to catch the premier of Eclipse (book 3) this June. And then he reminded me why we married. "I'd go for that!" and I knew he really would. Love me some BigDaddy. We dismissed it as funny and bad timing for our schedule this summer and called it a day. And then later that day, my high school BFF called me out of the blue. Yeah, the one who lives in Washington State. Like 3ish hours from Port Angeles. The wheels started and never stopped. You really can't give Nikki an idea like that and expect her NOT to run with it. A whole 5 minutes later I had an entire itinerary pop up in my email inbox. By the next day we had already planned, and confirmed, a child-free "side trip" to Seattle area/Port Angles/Forks/La Push for a Twilight tour this summer, after our annual California trip. I had no idea how it all happened. But somehow, this harebrained idea became a reality. I was riding on another Twilight-induced high. And shortly after that, BigDaddy and I went on a real D-A-T-E. dinner (with alcohol!) AND a movie, New Moon of course. But I can't tell you that last time we went on a date. Being broke + small children - free babysitters, er, um....close family = lack of parental dating. We had a blast and it was much needed after The Funk. 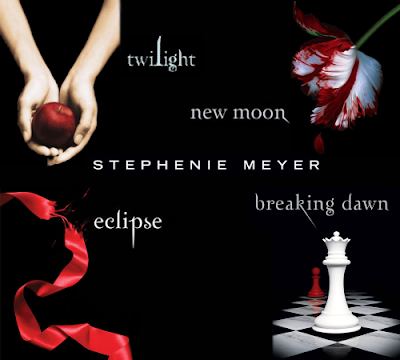 So back to my beloved Twilight. I can't say it was life changing, and trust me, some people make that claim. But it gave me a slice of life back. opened up the door to a fabulous summer and kicked started my new year with a big ol' W00t! For that I am thankful that I found the path to a world of vampires and werewolves. p.s. I'm Team Edward. Duh.